Are you tired of those matted carpets and dingy floors? Would you like to get a few more years out of your flooring before you replace it? Are there subtle and not so subtle odors in your floor or carpet? Do you have a stubborn stain or spot on your carpet? Our equipment matched with our expertise will help to restore the natural beauty of your old carpet, vinyl or ceramic tile floor to a like-new appearance. We use the most effective floor cleaning methods and the latest technology for maximum results. Our self-contained van mounted floor cleaning system is not only powerful but also the most non intrusive of its kind. We use industrial-strength cleaning agents that are not available to the general public. We have effective environmentally friendly cleaning chemicals available upon request. 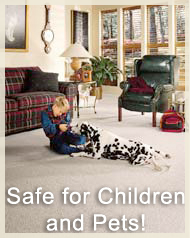 None of our carpet or floor products are harmful to pets or people, however we recommend our "Safe Clean" environmentally safe products for rooms that contain sensitive pets, plants and infants. Professional carpet cleaning will assure your family of cleaner, healthier indoor environment. Our hot water extraction cleaning system will restore the fresh, "baby clean" look and feel of your carpeting. The secret to fresh, clean carpet lies in our ability to power clean and remove all bacteria laden soil down to the carpet's backing. Only a whisper quiet wand and vacuum hose comes into your home. We'll return that freshness you remember when your carpet was new, and we'll give you the confidence that this time your carpet is really "baby fresh." We can quickly respond to your needs to extract water from soaked carpets, soil or to vacuum up and clean fire/water/smoke damaged floors before more damage occurs.